Fitness tracking on mobile devices aren’t anything new. Manufacturers have found interesting ways for you to track your weight loss and exercise progress. The new Galaxy S5 even has a built-in heart rate monitor. But it looks like Samsung has upped the ante with its new Simband and SAMI platform. In conjunction, SAMI and the Simband from Samsung provide a fairly comprehensive, real-time update of your health status; it’s almost like being hooked up to a health monitor at a hospital 24/7. Hit the jump and you’ll be surprised by just how granular the Korean-tech manufacturer has gotten and its plans for the Simband. Samsung outed the details of their SAMI platform today, which is the company’s new method for tracking your health. Using an amalgamation of both hardware and cloud storage for sensor data, SAMI is supposed to provide a comprehensive list of our health data pushed to our devices in real-time. With SAMI, you’ll be able to test your blood glucose levels and even any particles that are in the air around you, alerting you if you’re breathing in potentially harmful pollutants. This is where the Simband comes in. Samsung is calling it an “investigational device”, that works in tandem with SAMI, which has a collection of different sensors on its bottom. The Simband will track your heart rate and oxygen intake, however, the Simband can had additional sensors added to it that will not only monitor the different functions of your body, but of your environment as well. The Simband looks like a slightly modified Samsung Galaxy Gear watch. Ram Fish of Samsung, who was delivering the keynote on the new technology, was wearing the device during his keynote, which displayed his heart-rate, in real-time. The technology is intriguing, but Samsung hasn’t announced a concrete release date for the Simband or any other Sami platform products. There still needs to be some work done on sensors and Samsung needs to figure out logistics with their healthcare APIs, before the company can commit to a release date. Samsung also outed their “digital health challenge”; they’re offering up 50 million dollars to those who are working on any healthcare tracking projects, including any research and work on new sensor development. 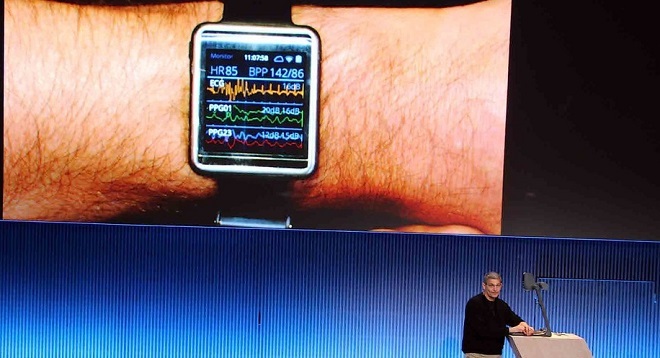 Samsung’s release of this information was certainly well-timed, as Apple’s developer conference is coming up, where rumor has it the Cupertino-based tech company will release details on its Healthbook platform along with its own health-tracking wearable. Samsung assures us that this health data is private and entirely in the user’s possession and control, however, if there’s anything we have learned about mobile data over the last couple of years, it’s that if someone wants to get something off of your smartphone, there isn’t much you can do to prevent it. User safety is going to be a big issue that hopefully both Samsung and Apple will take seriously, as private health data is a serious matter. Who’s excited about this? Or do you think that a complete body monitor system on your smartphone and/or wrist is a little excessive and potentially dangerous?